Plantronics APP-51 EHS Cable - 38439-11 - Headsets Direct, Inc. 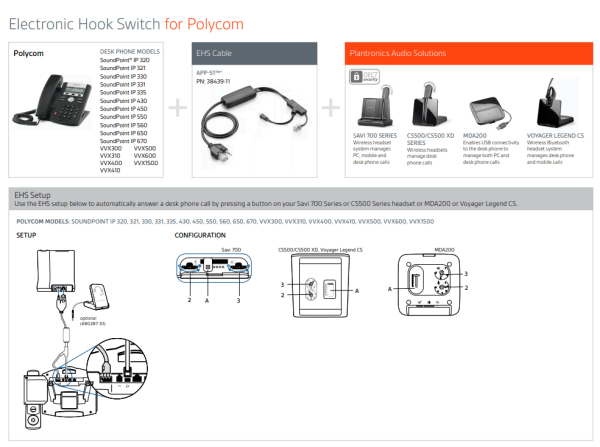 Most Polycom phones will need the headset port activated for EHS use, giving you remote answer/hangup capabilities. Now that the port is activated, you may plug the EHS cable into your phone and headset base. NOTE: Some phones will require a reboot for setting to take effect. If your phone has different options, your firmware may have been modified/updated. This is common with some cloud hosting companies. Consult your phones manual or contact your phones IT department for assistance. Note 1: Phone must be running SIP application 3.1 or higher and BootROM 4.1.0 or later. Note 2: Phone must be running SIP application 3.0.2 or higher and BootROM 4.1.0 or later. Note 3: Phone must be running SIP application 3.1.0 Rev C or higher and BootROM 4.1.0 or later. Note 4: Phone must be running SIP application 3.1.2 Rev B or higher and BootROM 4.1.0 or later. 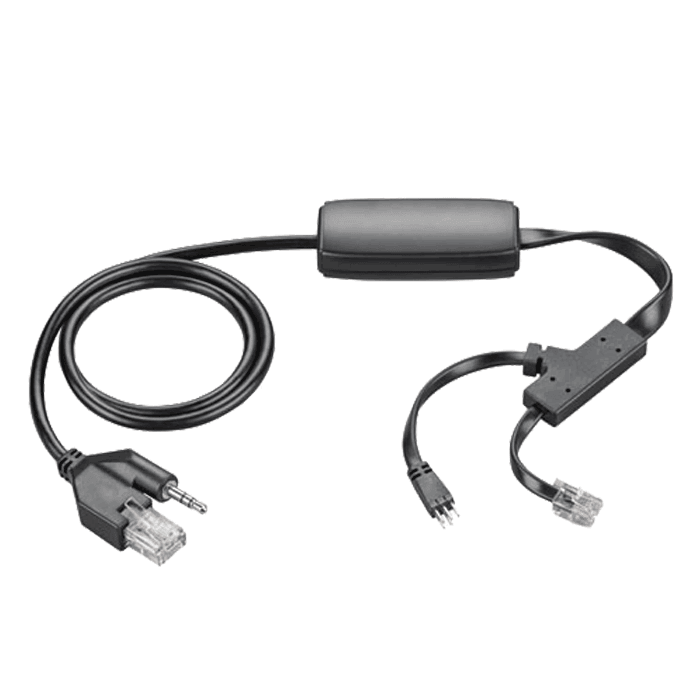 When using 78333-01 bypass the EHS cable audio connection. Very happy with my purchase. Easy to use and works great. I highly recommend this. 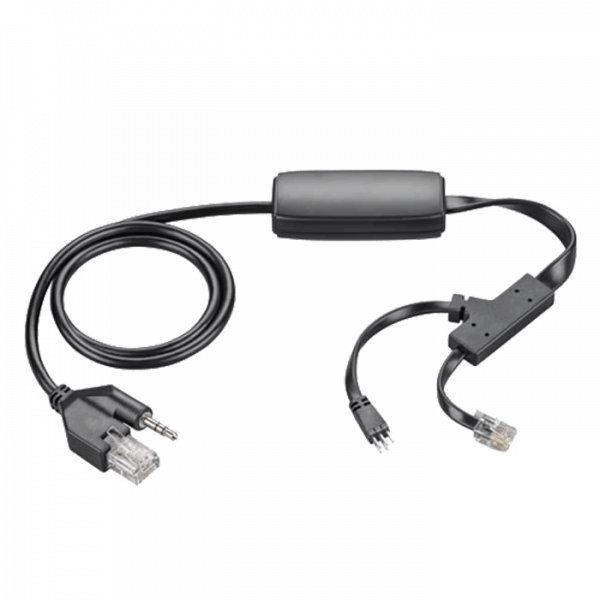 Everything about this cable was great, except the VVX201 model phone I have has the headset jack and phone jack are not in the same place and the cables that form the Y were too short to make the connection. An inch longer on either one would have done it. We had to buy another cable to make it reach. I think the VVX201 is the only polycom model that has the headphone jack not in line with the other connections on the base of the phone, so this is probably isolated to just that model. We called plantronics and even the person on the help desk was surprised by that. With the adapter, everything is great. These cables really helped our Receptionists so the headset button automatically opens the line. It really saved them some steps in answering calls. Product works for purpose indicated. I purchased wrong item, and Headsets Direct helped me get it straightened out. Allowed the return of wrong item and replaced with the correct one. All done very quickly, efficiently and at no expense. I am pleased with their knowledge and service. Our office staff is so happy we purchased this cable. We can easily answer our phones if we are away from our desk, and it made our jobs much easier. Works great in connecting my Platronics headset to my new Polycom phone. Very simple review because it works just like it says it should. Very easy to install between the headset and the Polycom phone. No issues. Just a great product. To answer and hang up without being at your phone, this is a must have. This Electronic Hook Switch eliminates the need for a clunky handset lifter. It provides a professional capability to a small business for a very affordable price. I would highly recommend this to give any small business a big business feel!